In one short passage, God declares human sacrifice unacceptable, and expects a loyalty even more fierce than the desire for children and family. In prior chapters, Saint Paul has proven that God saves us out of love alone, not in response to our good works. This passage is a "Hurrah!" for this gift, and reassurance to those who feel unworthy of it. Jesus is named Son of God and successor to all the leaders of his tradition. 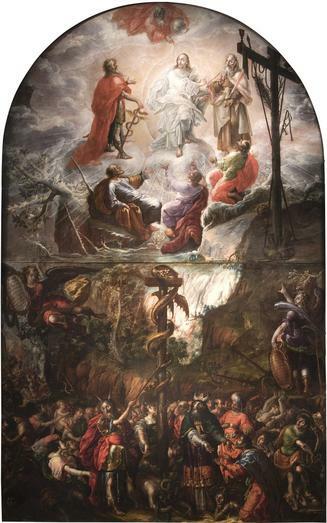 Our Liturgical Setting: The Catholic custom on the second Sunday of lent is to consider the transfiguration of Jesus, with the voice from heaven declaring, "This is my beloved Son. Listen to him." (Protestant churches generally use this gospel story and related readings on the Sunday before lent begins, the last Sunday of the Epiphany season.) This year, we all read that episode from Mark 9:2-10. After reading Sunday's gospel passage (as usual, the best way to start preparing for your own service as lector), you'll see how the images in the reading about Abraham and Isaac echo the images in the gospel. The Historical Situation: For brevity, the editors of the Lectionary have left out of this selection several verses. You'll do well to read the whole chapter, Genesis 22, to yourself. This story is all the more poignant because Abraham and Sarah had been childless so long and so unhappily until the birth of Isaac. The call to follow God is absolute, superseding the natural desire to have children and to pass on one's name to them. But, while God's call is absolute, the God of Abraham is different from the gods of contemporary pagan religions, in that this God rejects and prohibits the ritual sacrifice of children. The descendants of Abraham are to be many and powerful, always to enjoy a special relationship with God. Proclaiming the Passage: Read it slowly, telling the story in a matter-of-fact way, until the last paragraph. Make this last declaration most solemn. It's the great promise upon which the People of the Promise, our ancestors in the faith, were founded. "All the nations of the earth shall find blessing" in the people constituted here. We believe that blessing is the spread of the good news about Jesus, the descendant of this faithful Abraham. Our Liturgical Situation: This passage has in common with today's gospel the theme of Jesus' Sonship, and shares with the first reading the image of a father's willingness to give up a son. The Historical Situation: The context of this passage within the letter to the Romans is quite complex and difficult to describe. I hope it is not irreverent to say that Saint Paul has worked up a great sweat by a complex theological and historical argument about how we are really saved. Now he's very relieved to have finished that, and to have proven that God graciously saves us in Christ, and we need only have that faith. So this passage is a kind of cheer for the victory that God has wrought by saving us. It's also meant to give heart to people worried about being unworthy of God's love. One Literary Consideration: What of the metaphors of someone being "against us," bringing a charge, condemning or acquitting? The unspoken context is the image of a court of law, where God is judge and a prosecutorial angel would have God find us guilty (which is what Satan tried in the book of Job). But this case is already decided in our favor, as evidenced by these factors: God gave us his Son, so it's unthinkable that God would not also give us everything else; and no matter who prosecutes, their authority is outweighed by God who acquits us and by Jesus, raised up and interceding for us. Case closed. Q. Who can bring any charge against God's chosen ones? A. Not God, certainly; God acquits us. Q. Who will condemn us? A. Not Christ Jesus, certainly. He died and was raised for us, etc. While reading the Lectionary selection aloud to the congregation, recite the text as printed there, but use your inflection and timing to convey the meaning as clarified here. Moses and the Brazen Serpent and the Transfiguration of Jesus (1683), by Cristóbal de Villalpando, Mexican, (ca. 1649 – 20 August 1714). This is an altarpiece in the Puebla Cathedral. The picture came to my attention from Commonweal magazine. I find the article a little snarky, but it's a review of an exhibition of Villalpando's work in a city where this sincere Midwesterner would probably find a lot of snark. The excursus into Cézanne in the latter paragraphs is very interesting. 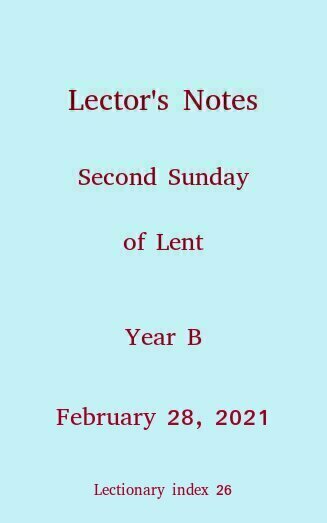 Lector's Notes should be easily readable on any device, including small-screen ones like cell phones and tablets. This is among the first of a few hundred pages to be converted to a responsive format (responsive to the kind of screen you are using). So when you're not serving as lector, and you arrive at church and mute your cell phone, you can brief yourself on the readings you're about to hear. Format conversion is a work-in-progress and will be so until maybe April of 2018.